You can’t help but be enchanted by Halifax, a maritime metropolis situated in Atlantic Canada. This small, walkable city has a lot of heart, and is celebrated for its welcoming residents, fascinating historic sites, lively music scene, sumptuous seafood, and well-preserved heritage buildings huddled along the harbor. Spring is an ideal time to discover Halifax’s cultural hotspots and upbeat neighborhoods. This guide is all you need to be charmed by this outdoor playground on a spring weekend getaway. Halifax waterfront: Haligonians, as Halifax residents are called, have a deep connection to the ocean that laps its shores. Get acquainted with local life by exploring the picturesque waterfront and 2.5-mile boardwalk — one reason National Geographic included Halifax on its “places of a lifetime” list. Stroll to sites like the Historic Properties, discover Nova Scotia’s marine history at the Maritime Museum of the Atlantic, and stop for a pint (and go on a tour) at Alexander Keith’s Nova Scotia Brewery, which has been supplying the city with beer since 1820. Then discover more of the waterfront and beyond on two wheels. Take an electric bike tour where you’ll get insight into Halifax’s cultural hotspots and history, including its connection to the Titanic. Halifax Citadel National Historic Site: Halifax Citadel National Historic Site is a living museum of Canada’s Victorian-era days. Hear the unmistakable call of the bagpipes and beat of the drum when exploring the majestic fort atop the hill overlooking the harbor. A series of four forts (completed in 1856) protected Halifax Harbour from 1749 to 1906. Tour exhibits and sites such as the soldiers’ barracks, school room, and the Army Museum. Then go deeper: don a uniform and kilt to be a soldier for a day, where you’ll learn how to march, fire your weapon, or play a drum. Halifax Seaport Farmers’ Market: Take a big bite out of Halifax by wandering the produce and artisan stalls at Halifax Seaport Farmers’ Market, which has been a mainstay since it first opened in 1750. The longest continuously running market in North America, it offers a generous slice of Halifax life. There, you’ll find more than 250 vendors selling items like fresh seafood from the Atlantic, award-winning regional wines, handcrafted chocolate, and preserves made with nutrient-dense haskap berries. Halifax Distilling Co.: After North Carolinians Julie Shore and Arla Johnson fell in love with Canada, the pair decided to leave their day jobs and join their families’ four generations of distilling heritage. In 2016, they opened the Halifax Distilling Co. in a downtown waterfront space and started producing a series of J. D. Shore craft rums in a beautiful copper pot still. Tour its productions, then kick back in the cocktail lounge where you can sip drinks made with rum, eat local food, and listen to live performances by local bands. Compass Distillers: Local grain and wild plants give Compass Distillers’ small-batch spirits — from aquavit to rum — a flavor that’s utterly Nova Scotian. At this distillery situated in the trendy North End neighborhood, you’ll find unusual ingredients such as kelp and spruce tips in its Spring GiNS, while its moonshine (essentially an un-aged whisky) is made with corn sourced in the nearby Annapolis Valley. Learn about the farm-to-bottle process during a tour and tasting, then pop into the bar for cocktails and snacks like popcorn with truffle oil and parmesan cheese. Coldstream Clear Distillery: Co-founder Riley Giffen’s interest in starting up Coldstream Clear Distillery was sparked by three things: an organic chemistry class, a source of spring water, and a family Halifax distilling history that dates back to the 1700s. Tour the distillery to see how its premium vodka and single-barrel aged rum are crafted, then taste its liqueur collection, which includes flavors such as salted caramel and homemade apple pie. Bar Kismet: You’re fated to fall in love with this North End restaurant wrapped in white wainscoting and warm woods. Residents have long embraced Bar Kismet’s seafood-focused fare, where you can taste the sea in small plates of raw scallops married with lemongrass and turnips that sit on the menu alongside larger dishes such as whole halibut au poivre (with pepper). Desserts are delectable and inventive too, like the brown butter cookie that comes with artichoke ice cream and fennel pollen. Pickford & Black: A new addition to Halifax’s delicious dining scene brings the trifecta to hungry Haligonians: local seafood, local craft beer, and a waterfront patio. Named for a Nova Scotia shipping firm established in 1876, Pickford & Black comes from the same folks behind the beloved Gahan House Harbourfront restaurant and brewery, which once occupied this prime spot in the Historic Properties. The area is a destination in its own right, with warehouses dating back to the late 1700s that have been transformed into modern eateries, boutiques, and more. The Five Fisherman Restaurant: Whether you’re hankering for oysters Rockefeller, a classic lobster dinner, or seafood chowder stuffed with scallops, shrimp, and halibut, the Five Fisherman Restaurant is the place to please your palate. There are also vegan and vegetarian items like red beet hummus and roasted butternut squash risotto. Want to slurp raw oysters? Duck into the Little Fish Oyster Bar downstairs. This celebrated restaurant is situated in a building with an intriguing backstory. Originally a school house in 1817, it later became the John Snow & Co. Funeral Home, which ministered to a number of wealthy people who met their fate onboard the Titanic. That’s one of the reasons the restaurant is considered the most haunted spot in Halifax. Surfing: Surf’s up year-round, where you can ride the waves right in Halifax Harbour. Grab a board, don a wetsuit, and learn how to surf off the sandy shores of Cole Harbour-Lawrencetown Coastal Heritage Park. For another type of adrenaline rush, harness the wind and take a “give it a try” kitesurfing lesson, where you can glimpse at the cityscape as you zip across the sparkling Atlantic Ocean. Whale watching: Feel the thrill of setting off to sea on a whale-watching tour departing right from the Halifax waterfront. In springtime, these gentle giants migrate to the area’s waters to feed and breed. Keep your eyes open for massive fin or “razorback” whales (named for their distinctive ridged dorsal fin), which are the second-largest species on the planet after the great blue whale. 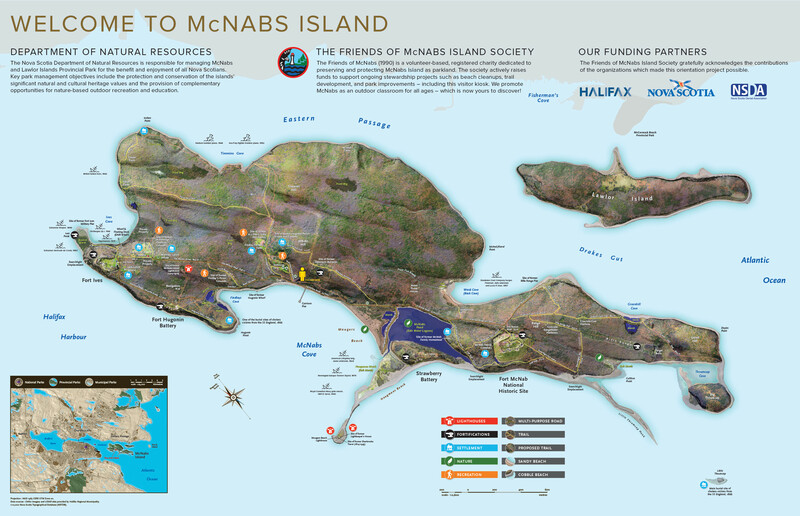 McNabs Island: Take a short boat trip (bring your own picnic) from downtown Halifax Harbour or give your arms a workout by kayaking to explore one of Halifax’s best kept secret, McNabs Island, a natural wonderland that feels like it’s a world away. More than 14 miles of hiking trails lined with maple and spruce trees crisscross the island, leading to lighthouses, lagoons, and captivating sites like former A. J. Davis Soda Pop Factory and Hangman’s Beach — a dark place from the past where British Admiralty hung deserters around 1800. Take a tour to learn about the island’s military fortifications and some of the 200-plus species of birds and wildlife that make their homes on this idyllic island. Anne-Sophie Vallee: Anne-Sophie Vallee’s contemporary jewelry is created with a playful touch. The Halifax-based designer combines precious metals with modern techniques as seen in her chunky rings and “broken hoop” earrings, which come in springtime shades like lavender and mint. Pieces are manufactured locally and can be found at Makenew, a chic shop in downtown Halifax that stocks everything from swimsuits to linen tops and textiles. Made in the Maritimes: Head to the 1918 Hydrostone Market to seek out this artisan boutique filled with items handcrafted in Nova Scotia, New Brunswick, and Prince Edward Island. Made in the Maritimes focuses on selling contemporary and top-quality goods such as dramatic landscape paintings, pottery in punchy hues, woodwork and carvings, as well as gourmet edibles and other gift-worthy treasures and treats. Inkwell: Tactile keepsakes, timeless letterpress stationary, ceramics, textiles, and other crush-worthy art pieces, including Inkwell’s own line of cards, are sold at this cheery downtown boutique and workshop. Owner Andrea Rahal, who approaches letterpress printing as an art form, showcases the work of 200-plus independent artists from “around the corner” and worldwide. Lisa Drader-Murphy: Easy-to-wear dresses, circle skirts, and tunics are the go-to items Lisa Drader-Murphy sells in her eponymous boutiques. The Halifax-based designer established her womenswear company in 1997. Her extensive collections (including a 10-piece travel capsule wardrobe) are designed and manufactured in the region’s Annapolis Valley. Art Gallery of Nova Scotia: More than 17,000 works from 2,000 artists comprise the permanent collection at the Art Gallery of Nova Scotia. This institution is dedicated to acquiring the work of visual artists who have strong ties to Nova Scotia (such as Maud Lewis, arguably Canada’s best-known folk artist) and the Atlantic provinces. See temporary exhibitions, some which spotlight Nova Scotia, like the work of Afghan-Canadian artist Hangama Amiri. After visiting, contemplate the work over a cappuccino and plate of antipasti at the in-house Pavia Gallery – Espresso Bar & Café. Neptune Theatre: For almost six decades the Neptune Theatre has been engaging audiences with creative storytelling that reflects the history and diversity of Halifax and Atlantic Canada. Spend an evening at this cultural hub seeing performances such as The Color Purple, based on the Alice Walker novel and produced on Broadway by Oprah. Then channel that inspiration by practicing your improv, dance, or drama skills during a drop-in class at the Neptune Theatre School. Canadian Museum of Immigration at Pier 21: Almost one million immigrants passed through Pier 21 between 1928 and 1971, including Sir Winston Churchill who disembarked during the Second World War. Trace your family roots, and learn about Canada’s compelling 400-year history as an “immigration shed” at the Canadian Museum of Immigration at Pier 21. Be sure to check out Family Bonds and Belonging, a temporary exhibition that explores the complex themes of family from history to modern day.